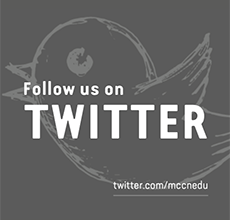 Compassion, perseverance and accountability are just a few of the many positive attributes that guide each day’s journey for Mount Carmel College of Nursing student, Amanda Utzinger. Now in her junior year at MCCN, Amanda was a senior in high school when her earlier interest in nursing as a career became a firm decision. Her 82-year-old grandmother, who had become seriously ill, was admitted to hospice. “I was really inspired by the compassion the nurses showed to Grandma and our family,” Amanda recalls. “It was more than just how they cared for her, but also how they cared about her as they tended to her every need and helped her through the end stage of her life,” she says. Just three years earlier, Amanda first dreamed of becoming a nurse. One of the star freshman players on her soccer team, it was not unusual for her to come home bone-weary and feeling pretty beat up after an afternoon of hard practice. However, when her parents recognized that their daughter’s pain level, along with swelling and stiffness, might be caused by more than simple sports-related concerns, visits to physicians’ offices and Nationwide Children’s Hospital resulted in a diagnosis of systemic Juvenile Rheumatoid Arthritis. Amanda’s perseverance through her own illness and recovery came to the fore in helping the Grove City teen successfully complete high school and subsequently gain admittance to MCCN. 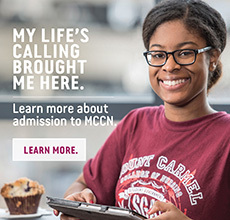 “I chose Mount Carmel College of Nursing because of the warm atmosphere and because I felt the faculty members I met were truly interested in helping me achieve my goals,” she says. Amanda has proven be to be a “star player” at MCCN, too. She is not only a good student, maintaining a 3.7 GPA, but recently was awarded three scholarships. She is the first recipient of the inaugural Tammy Snyder Weidner Endowed Memorial Scholarship, which is in memory of 32-year Mount Carmel associate Tammy Snyder. Snyder, who worked her way from diploma graduate of MCCN to Chief Nursing Officer, Mount Carmel St. Ann’s after earning both her Bachelor of Science in Nursing and Masters of Business Administration, was a proponent of life-long learning. Amanda’s winning essay discussed not only her own life-long learning goals, but also her understanding of and dedication to accountability in nursing practice. “I believe that a life-long learner is someone who is constantly striving for more knowledge, which can be gained from experience, reading and learning from others, as well as formal education,” Amanda asserts. Also the recipient of the Delores Street Ohio Contractors Association Memorial Scholarship and the Monica and Stephen Walter Scholarship, Amanda attributes her mother with instilling in her a desire for learning and is grateful to MCCN for the opportunities she has realized. “My taught me that education is valuable because it is something that can never be taken away and it opens endless opportunities. I will always be very grateful to her for that – and I’m also very grateful to MCCN for helping me to achieve my dream of becoming a nurse so that I can help others,” she adds.